I’m always looking for interesting face masks, I love the way my skin feels after washing them off. I have seen a lot of at-home masks lately and combined a few recipes to make my own. This is great because they are items you probably already have in your kitchen! Combine the water and lemon juice in a bowl and then slowly add your baking soda. Keep mixing it in with a spoon until it starts to turn into a paste. Scoop it out with your (clean! )fingers and start to gently massage it into your skin. Gently massage for a few minutes and you will start to feel the baking soda turning into less of a paste and more of an exfoliant scrub. After my entire face was covered, I let it sit for 10 mins and then washed the mixture off with warm water. 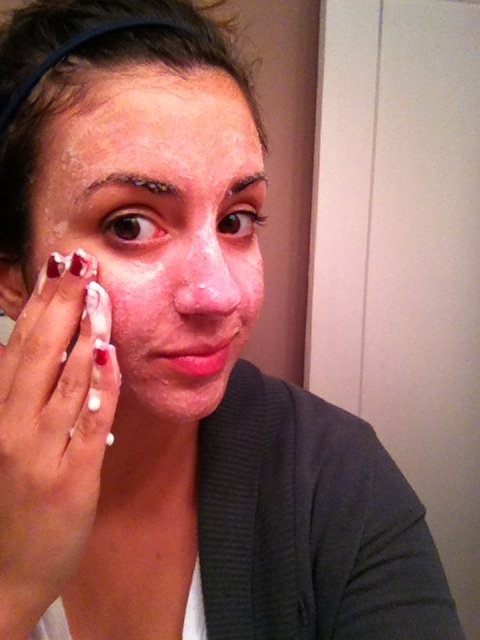 This may be one of the most unflattering photos of me…but I felt like I had to share so you can see what the paste becomes on your face. My skin was left feeling clean, soft, and tight! I’m going to continue to use this face mask every few days and I’ll let you know if I see any difference in my skin. 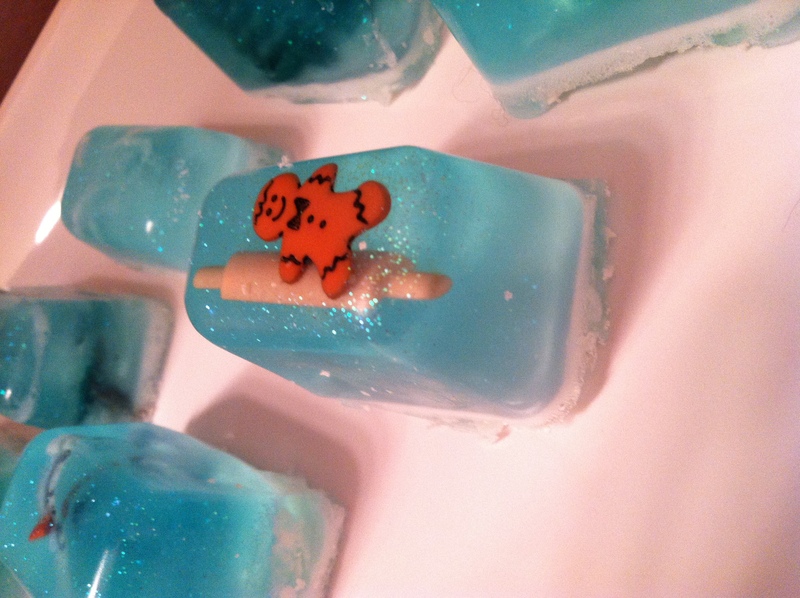 This is perfect for the beginner soap makers out there who would like to make some personalized soaps in bulk for holiday gifts. I got this idea from the Alpha Mom blog. 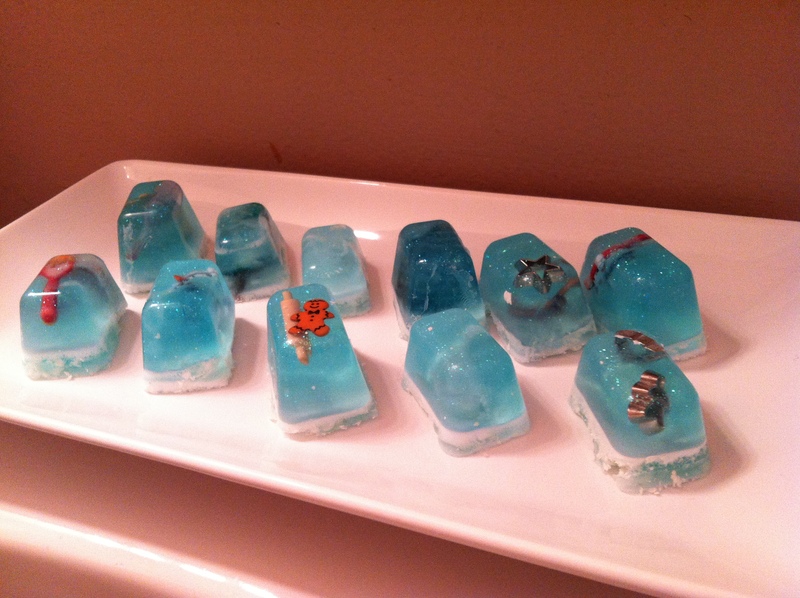 I stumbled on it when I was searching easy soap recipes and it was just too cute not to try. It cost me about $15 in supplies and took about an hour from start to finish. This makes homemade gifts for about 30 people, so in my book- this is an amazing project. Don’t be afraid by the word “Glycerine”. It was actually very easy to find at the store. I made one stop at my local A.C Moore and found all of the soap materials I needed including the glycerine. 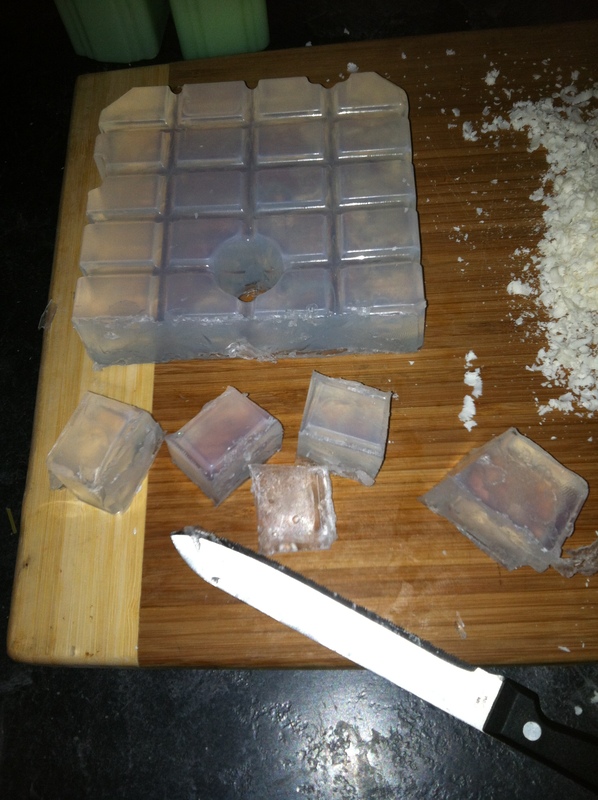 Chop up your glycerine into ice cube-shaped blocks (which is pretty easy if you get the block of glycerine like I did). Then shave your white bar soap with your cheese grater into a pile. 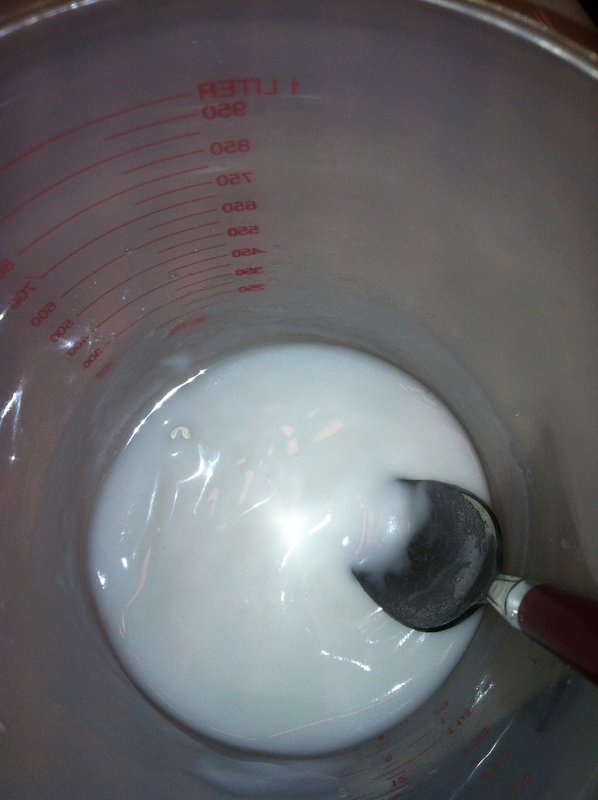 Put about 6 of your glycerine chunks into a mixing bowl for 1 minute. Gloppy goo. 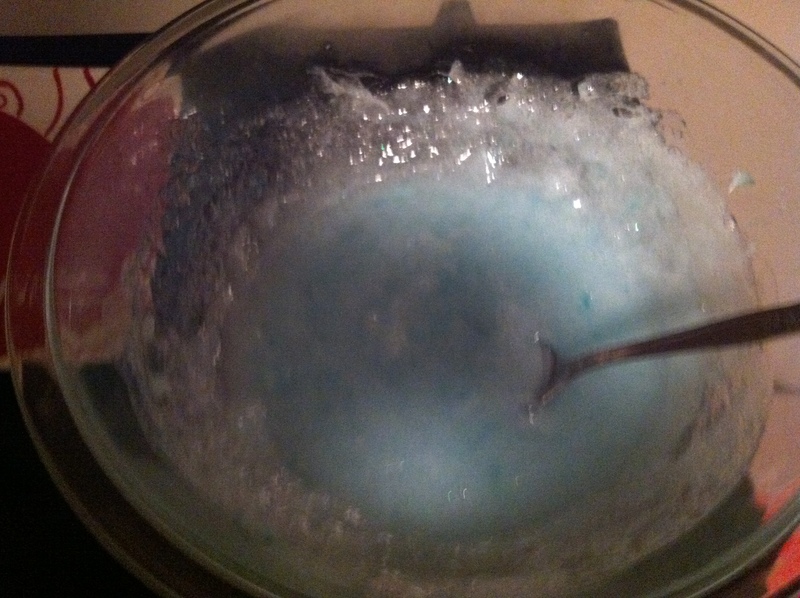 So add your soap dye, scent, and soap glitter to the bowl. I added 2 drops of blue and about 8 drops of lavender vanilla scent. I was iffy about the soap glitter- but I’m really glad I decided to use it. It makes the end product sparkle and seem more “winter-ish”, and it doesn’t come off at all on your hands when you use the soap. So I would definitely recommend picking up a little jar (I think it was about $3 and well worth it). So here is where there is a little guess work involved. 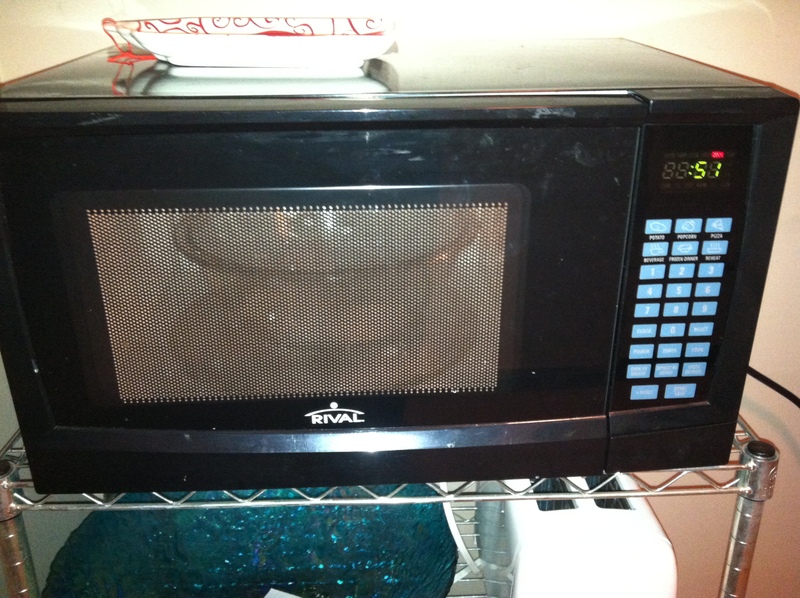 Stick your goop back into the microwave for about 20 seconds at a time. You want it to be as liquid as possible. 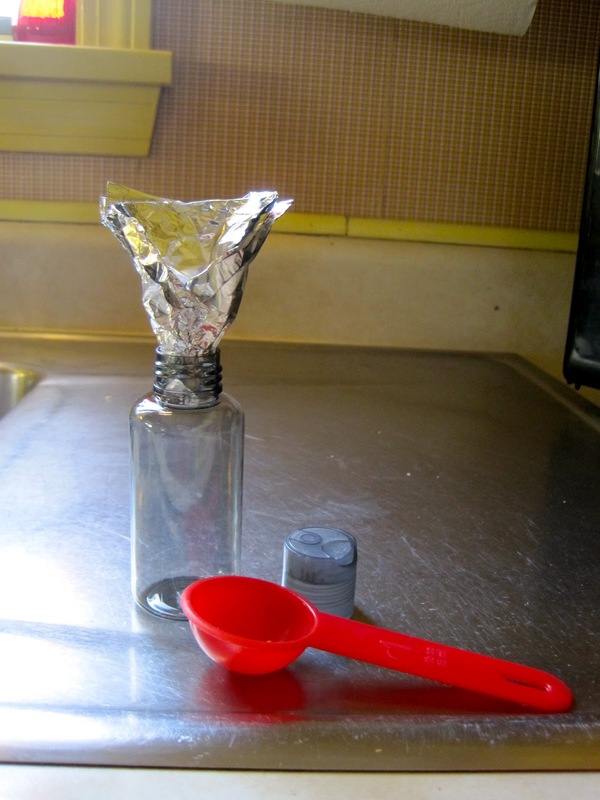 Pour your soap liquid into a measuring cup so it’s easy to pour into your ice cube trays. WORK QUICK! This is another one of those projects that I wasn’t able to take as many photos of the process as I would have wanted. 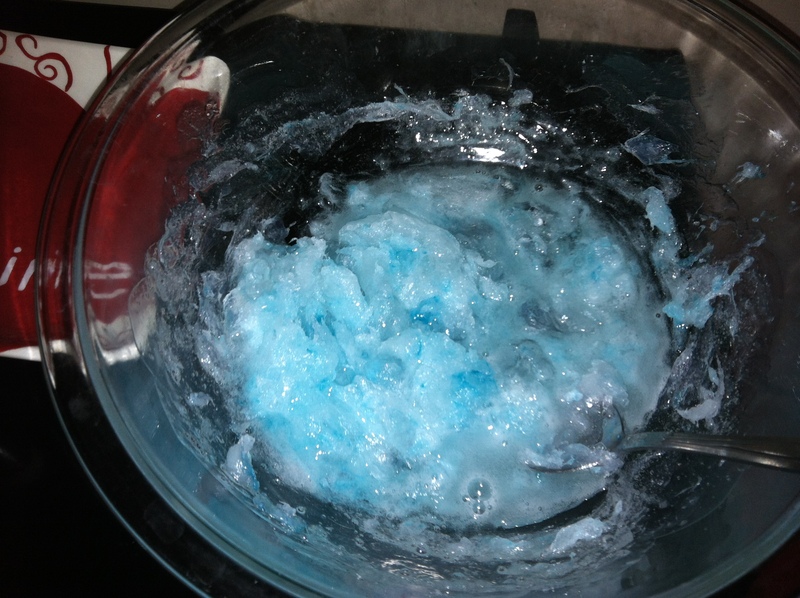 If your mixture solidifies, just put it back in the microwave. 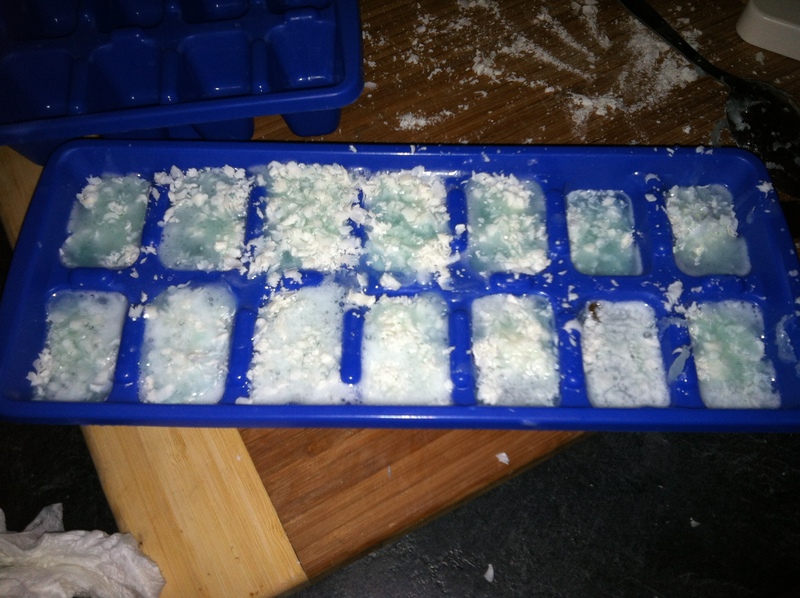 Fill your ice cube tray only about 3/4 of the way up. You want to leave a little room for your “snow”. Place your fun little figurines into each cube while it is solidifying. I found little gingerbread men, snowflakes, and other fun embellishments in the scrap-booking section. 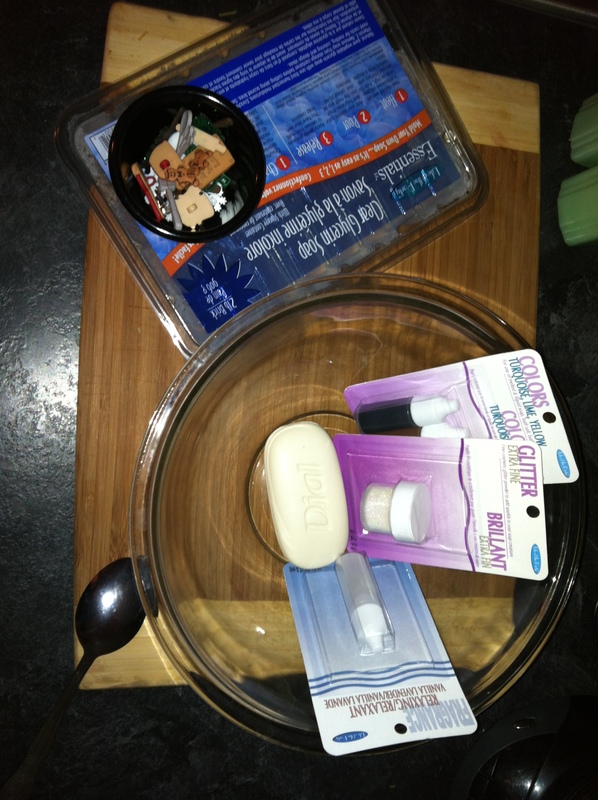 Sprinkle the white bar soap shavings on top of the soaps (which should now be turning solid) and then add pour the last bit of your liquid glycerine on top of each cube to make sure the “snow” sticks. Pop the tray in your freezer for about 20 minutes, pull out, and enjoy! 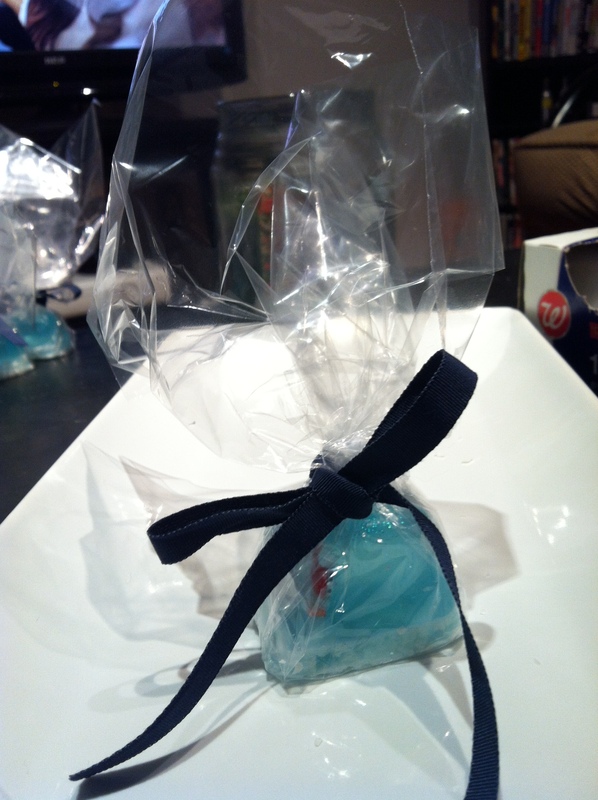 I packaged mine with clear sandwich bags and ribbon. I’m keeping them in my fridge until I’m ready to give them as little gifts this holiday. These would be perfect for the child who frequently skips washing their hands. Once they use up the soap- they have a little toy! 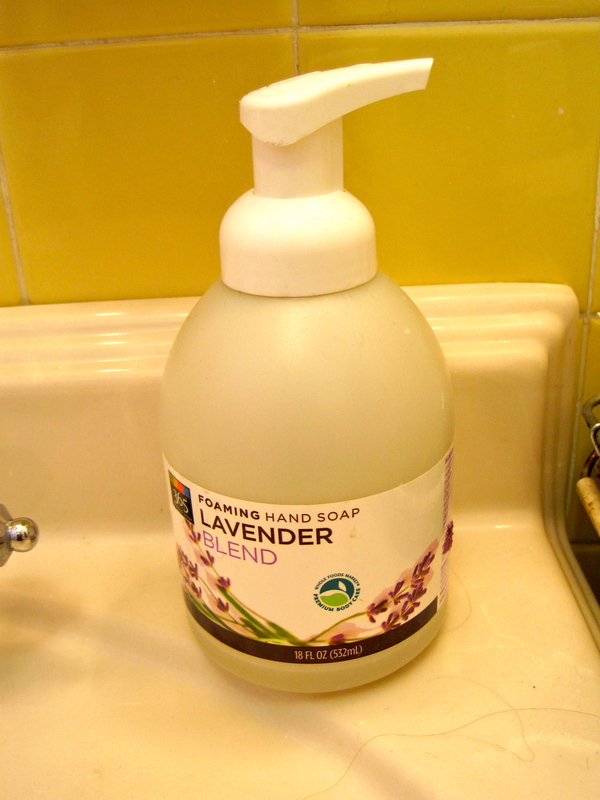 Well, we were running low on our current bottle of $5 foaming hand soap but I had an economy sized bottle of traditional liquid hand soap… what’s a girl to do? Scour the internet on how to use what I have to make what I want, of course! 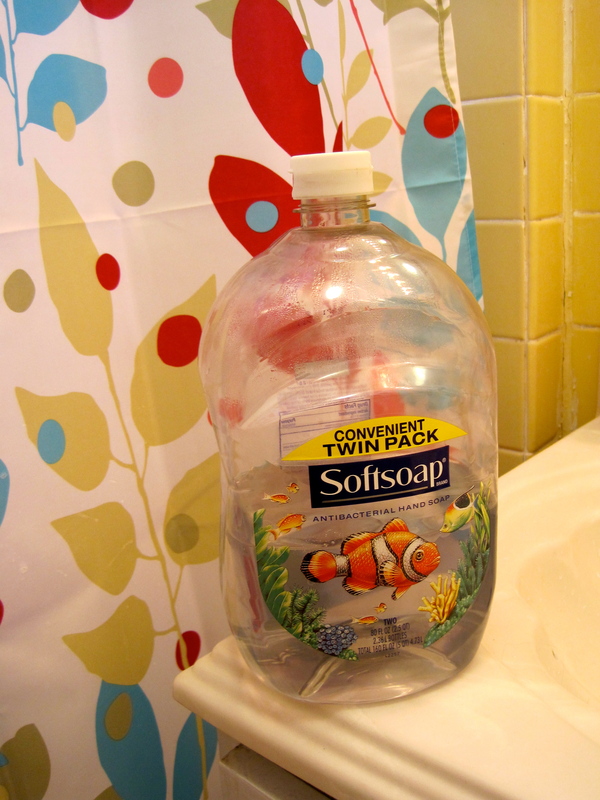 One (almost) empty bottle of foaming soap coming right up! 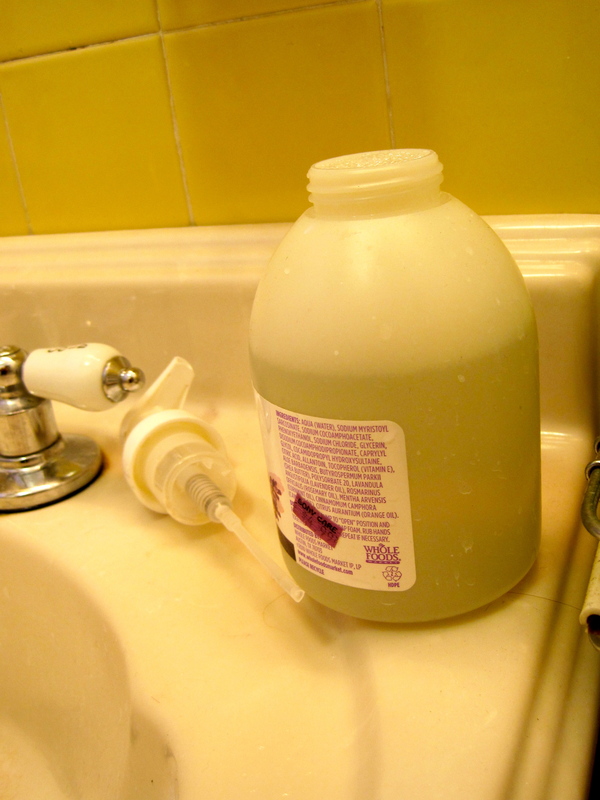 One economy sized bottle of liquid soap? Check! Fill bottle almost to the top with water first. Otherwise, the soap will foam up and create a bit of a mess. Add soap, return the cap and shake well! Ta-dah! 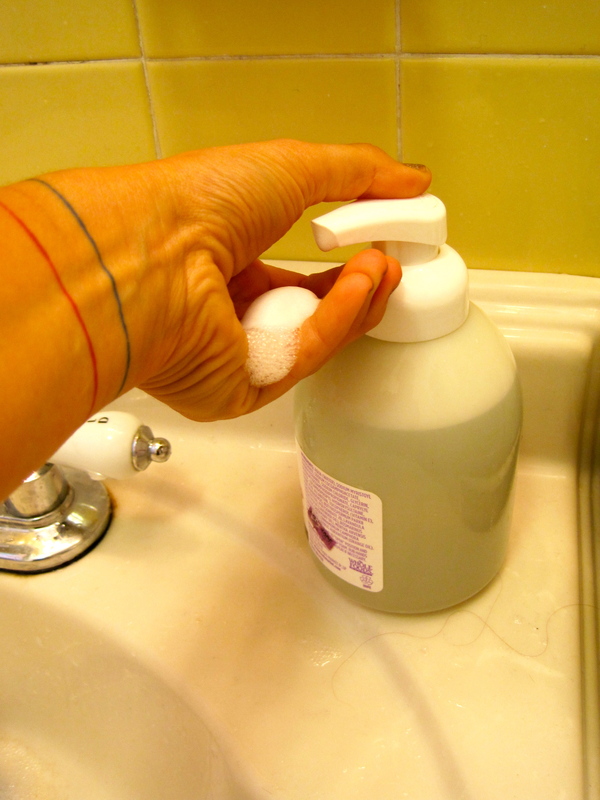 Foaming soap at a fraction of the cost and better for the environment. Ever since high school, my complexion has not been spectacular – not awful, but not the best. I get breakouts which I then pick at and immediately regret, yet I can’t stop myself. So, needless to say I have tried many of the face wash fads – ProActiv, ProActiv rip-offs, antibiotics, creams, washes etc. 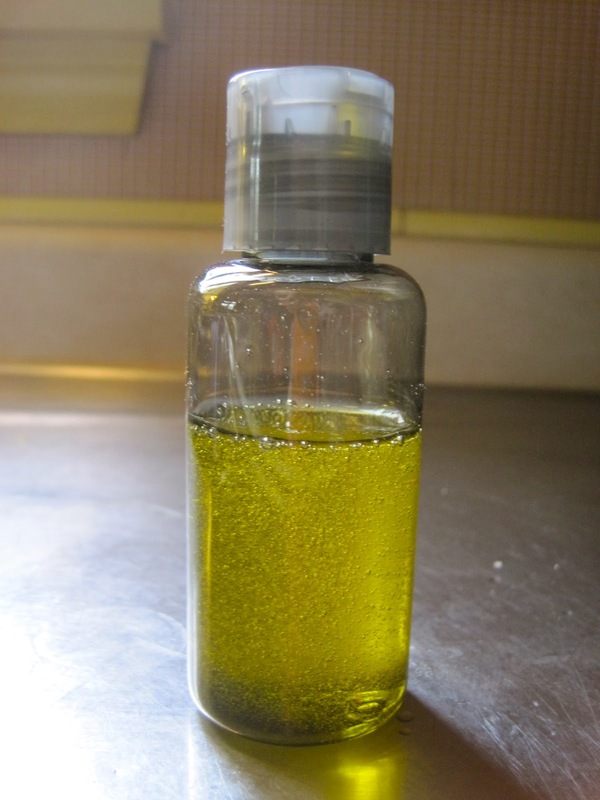 Still not pleased with the results, I came across some articles on oil based face washes. Advertising has always told me that oil free is the way to be, but logic kicked in when it was pointed out to me that oil removes oil. Duh! I knew this already because I work at a pizza place and we use oil to clean our grill, so why should my face be any different(okay, so maybe this is a stretch, but it made sense to me)? This cleanser is seriously cheap on top of the fact that there are no chemicals, no dyes or perfumes, and it’s easy to customize to your skin type. We didn’t have a funnel, so I made a makeshift one with some tin foil. 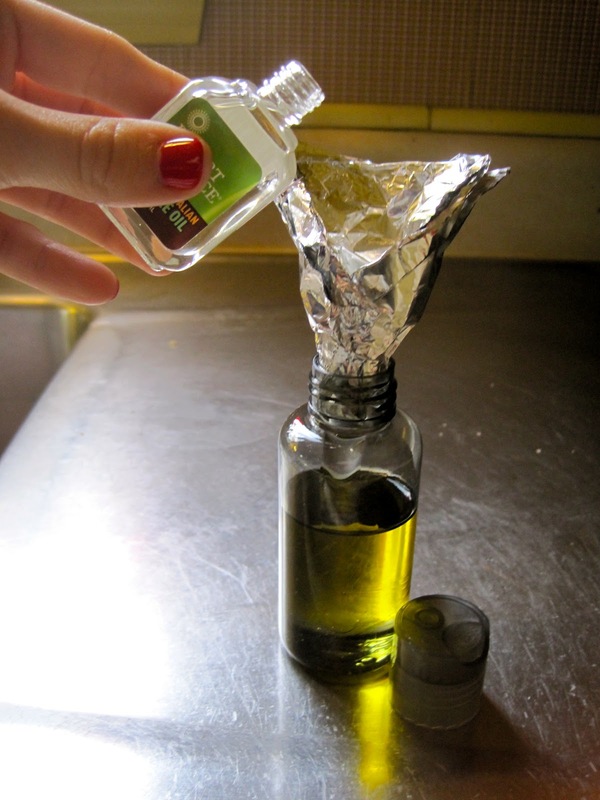 I then measured out three parts olive oil to two parts castor oil. The dryer your skin is, the more olive oil you want. 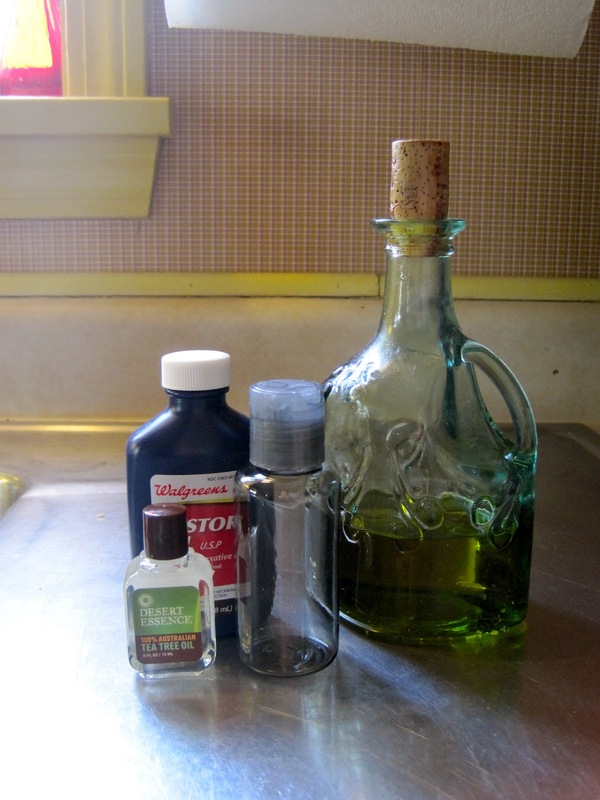 The oilier your skin is, the more castor oil you want. Adjust accordingly, I sort of just went for the middle ground. I had also heard of the benefits of tea tree oil on acne so I added a few drops to the mixture, which also gave it a nice refreshing scent. Shake it up and test it out! To use, apply a quarter size amount to your face – do not wet your skin before – and rub into your skin for about one minute. Then using a hot towel, steam your face for about a minute then wipe off. It’s that simple! And as an added bonus, you don’t need to moisturize afterwards. I’ve only been using this for two days and can already see an improvement in my skin, so definitely give this a try if you’re like me and have had trouble finding a solution to your skin woes.